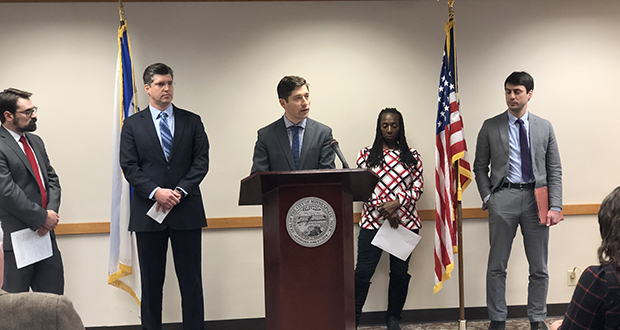 Minneapolis Mayor Jacob Frey says his first case as an attorney was in his mind as he set in motion an initiative to boost the number of lawyers working pro bono on eviction cases. It was a tenant eviction case, the mayor recalled. Frey had met his client only once face-to-face and learned the story of his eviction. Beyond that, Frey knew only that there was a hearing in court the next day, which he duly attended. But Frey knew enough to get some critical documents entered into evidence and which questions to ask his client on direct. He also knew his tenant had a righteous defense—but lacked verbal skill to articulate it alone. Flash forward to Nov. 14 and the announcement of the More Representation Minneapolis initiative. The effort reflects the mayor’s top priority—affordable, stable housing in his city. At last count, the initiative involved the Volunteer Lawyers Network, Mid-Minnesota Legal Aid and 12 law firms committing attorneys to pro bono eviction defense and rent escrow/tenant remedy actions in 2019. Volunteer Lawyers Network and Mid-Minnesota Legal Aid will anchor the effort, Frey said. In fact, he initially wanted to call the effort the “Sixth-and-a-half Amendment,” after the section of the constitution that guarantees criminal defendants the right to counsel. That name was rejected because—at this point, at least—housing representation is still not considered a right. The immediate goal of More Representation Minnesota is to add 25 additional attorneys to the Volunteer Lawyers Network and increase the group’s housing representation work by 20 percent. According to the network’s most recent annual report, its volunteer lawyers provided pro bono service in 1,907 such cases in 2016-17. But Frey said he would love to see more than 25 new lawyers come on board. “The more the merrier,” he said. Frey said he learned early in his legal career that many lawyers are eager to do pro bono work, especially young counsel looking for crucial trial experience. The initiative provides the legal community direction toward that goal, at least as it applies to housing cases. “I think it is an area where there is a need,” he said. Frey said the tenant initiative dovetails with his proposed $150,000 investment in 2019 for a pilot project to fund legal services for some low-income renters facing displacement. That’s on top of Frey’s $40 million affordable housing proposal for the city. He calls it a holistic approach to the affordable housing crisis. It’s hard to quantify the number of “unfair” evictions that take place each year and Frey acknowledges that when people don’t pay rent, evictions can be righteous. But data from the Mid-Minnesota Legal Aid suggests that people who go unrepresented in eviction proceedings often get treated unfairly, the mayor asserts. With full legal representation, he said, citing that data, 95 percent of tenants won or settled their eviction cases. Without a lawyer, tenants won or settled just 61 percent, the data show. With full representation, he said, 78 percent of tenants left court with the eviction cleared from their record, he said. Only 6 percent of unrepresented tenants were able to clear evictions. He said the new initiative isn’t an effort to target landlords—who after all, also are part of Frey’s constituency. It is instead an attempt to balance the scales by helping make sure that, in court, the landlord’s counsel isn’t the only lawyer in the courtroom. At a press conference last week, Frey said an internal study by his office found that 3,000 tenant evictions get filed annually in Minneapolis, many against low-income and minority residents. Over a three-year span, he said, evictions were filed against roughly half of renter households in North Minneapolis. But in only about 10 percent of those cases were tenants represented by counsel, he said. Law firms already committed to the push include Barnes & Thornburg; Dorsey & Whitney; Faegre Baker Daniels; Fredrikson & Byron; Jones Day; McEllistrem, Fargione, Landy, Rorvig & Eken; Merchant & Gould, Robins Kaplan, Anthony Ostlund Baer & Louwagie, Gray Plant Mooty, Stinson Leonard Street and Maslon LLP. Other law firms interested in joining may email Muria Kruger, the Volunteer Lawyers Network’s resource attorney and program manager, at muria@vlnmn.org. She can be reached by phone at 612-752-6647.